Bentler, P. M. (1968). Alpha-maximized factor analysis (Alphamax): Its relation to alpha and canonical factor analysis. Psycho­metrika, 33, 335-345. Li, L., & Bentler, P. M. (2001). Resampling approach to greatest lower bound. Under review. 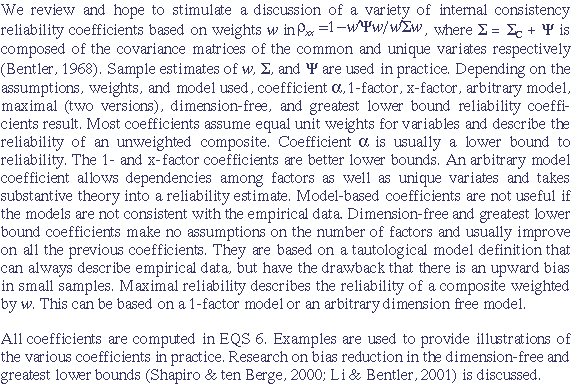 Shapiro, A., & ten Berge, J. M. F. (2000). The asymptotic bias of minimum trace factor analysis, with applications to the greatest lower bound to reliability. Psychometrika, 65, 413-425.